Living on a budget and within your means is an important golden rule for most retirees while living on a fixed monthly income. In our Mesa retirement community we try and provide many opportunities for outdoor activities, brand new hobbies, and a chance for retirees to enjoy the year round sunshine from within our spacious Arizona mobile home parks. Though we are also conscious of the financial constraint most retirees are put under after their peak earning years are over. For this reason we want to supply our Palm Garden residents with options to enjoy exciting adventures and memorable experiences but within their financial plan. Whether you’re planning a day trip or a weekend getaway, whether you’re enjoying the blue skies or the cool desert nights, when it comes to experiencing all that Arizona has to offer, one thing is for certain: you simply can’t miss the fine selection of restaurants right in our own backyard. 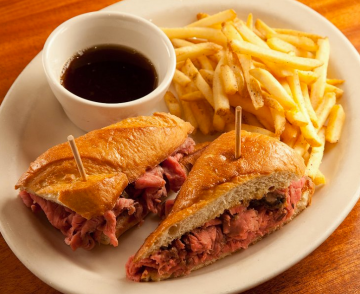 Charleston’s is a great choice for Palm Garden’s retirees as it’s a quick 7-minute drive from our location on E. Main St. Charleston’s boasts a cozy and casual dinning experience with a modestly priced menu as the average plate runs about $11-$30 dollars per person. The menu features traditional American classics and is cooked from scratch on a daily basis. The croissants are to die for and a fan favorite is the steaks and garlic mashed potatoes combination. Charleston’s Mesa location is on Stapley Dr. and features wheelchair access in addition to a great senior discount that Palm Garden’s patrons should be sure to take advantage of. Portions are fairly large so depending on how hungry you are, you may even be able to split an entrée with friend or take your leftovers home to heat up the following day. Given a 4 star Yelp rating, Charleston’s choice if you are in the mood to eat out! Located just 2 miles East of Palm Gardens on E Main St. the Wild Berry Diner is a popular breakfast and lunch hangout for many Palm Garden’s retiree’s. The Wild Berry has a classic all American small town diner ambiance and is filled with aromas of down home cooking. The portions tend to be larger and the price per plate averages at around $10 dollars or under. Aside from its delicious food the Wild Berry Diner is also a great spot for seniors looking to save money as they accommodate a special section of their menu at discounted prices specifically for retiree’s on a budget. Wheel chair accessible and breakfast is served all day long! If you’re not in the mood to cook but still have a taste for a good home cooked meal the Wild Berry Diner is so close to Palm Gardens you’ll feel like you haven’t even left the mobile home park. Boasting a 4 star Yelp rating, the Wild Berry Diner’s food, location, and price point is hard to beat. A quick 10-minute drive from Palm Gardens the Blue Adobe Grill is located on Country Club Dr. in Mesa. For mobile park residents that are looking for a little south of the border flare in their meal the Blue Adobe Grille is a great option with authentic Mexican lunch and dinners. Blue Adobe Grill unfortunately does not offer senior discounts but it does claim one of the best happy hours in Mesa to make up for it. Happy hour is from 3-6:30pm and features $2 off any item on the front page of their menu. The house margaritas are hard to beat at $4 and they also offer $3 drafts, wines, and wells for thirsty patrons. Happy hour is very popular so we recommend arriving a few minutes before 3pm in order to secure a table! The Blue Adobe Grill is wheel chair accessible and has an average of $11-$30 plate average if you decide to not go during happy hour. With over 200 reviews and a 4 star Yelp rating, Blue Adobe Grill is a classic Mexican restaurant in Mesa worth checking out at least once!